Another Scottish loss against the Dutch. This time the stakes were much higher than some poxy game of football or cricket. Steve orders new phone in advance and arranges transfer to new network. Steve still has on new phone. Miguel walks into O2 and gets an upgrade for the price of a McChicken sandwich. Bah! Even more worrying is that i now blog about myself in the third party. 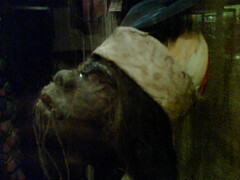 Pic is of shrunken head in Pitt Rivers museum oxford. So who else April Fooled you? Tomorrow will be the day you can even the score and we can start sharing our experiences, being the technology geeks that we are!